One of the kitchen gadgets I use least often is the mini deep-fryer– it’s perfect for frying up a batch of chicken tenders, or an experimental batch of cronuts (I promise I’ll blog about those someday), but then you’re left with a bunch of oil you don’t know what to do with, and it’s a pain to dispose of, so I rarely go to the trouble. Still, once you’ve fried one thing, you may as well fry a bunch of things to avoid waste, so after my husband made some of the aforementioned chicken tenders that’s what I decided to do. But what to make? I ran through the possibilities in my head, discarding some for being too involved, others for being too boring, and kept coming back to apple fritters. I love apple fritters, but almost never buy them because I invariably get distracted by the chocolate-covered old-fashioned donuts that are my favorites. But I’d faithfully bookmarked the recipe at some point, and when I came across it on my computer it was like fate was telling me that now was the time! It’s no secret that I adore cute food, and cute food that’s been miniaturized is automatically cuter than the original. 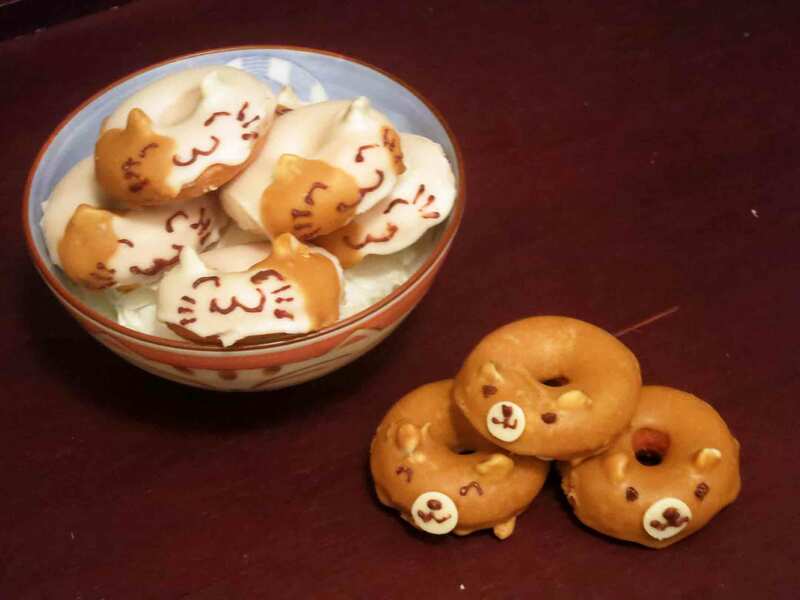 So when I saw these cute-tastic Japanese animal donuts, I immediately tried to think of ways to make them myself, only extra-adorable. That’s where my mini-donut maker came in. Another one of my kitchen unitaskers, the mini-donut maker churns out ridiculously precious little donuts, 6 at a time, without all that frying. No, the donuts don’t have the classic texture of a fried donut– firm to the initial bite, then giving way to pillowy softness– but they’re perfectly respectable baked donuts, and did I mention they’re cute? I’ve made these with regular boxed cake mix before, but the soft fluffiness of the cake made the donuts one-dimensional and boring– plus, the relative thinness of the cake batter made the little donut wells more difficult to fill properly. I’ve learned that boxed pound cake mix actually works best for mini donuts– it’s thick enough that it can be easily piped into the donut wells, it rises to just the right height to make a nice rounded donut, and the pound cake flavor is pretty close to a classic old-fashioned donut, which is my favorite. Sure, I could make my own pound cake mix from scratch and use that, but these are so small and will be coated with so much sugary icing that no one is going to notice the flavor of the cake– at least not the difference between homemade and box mix. 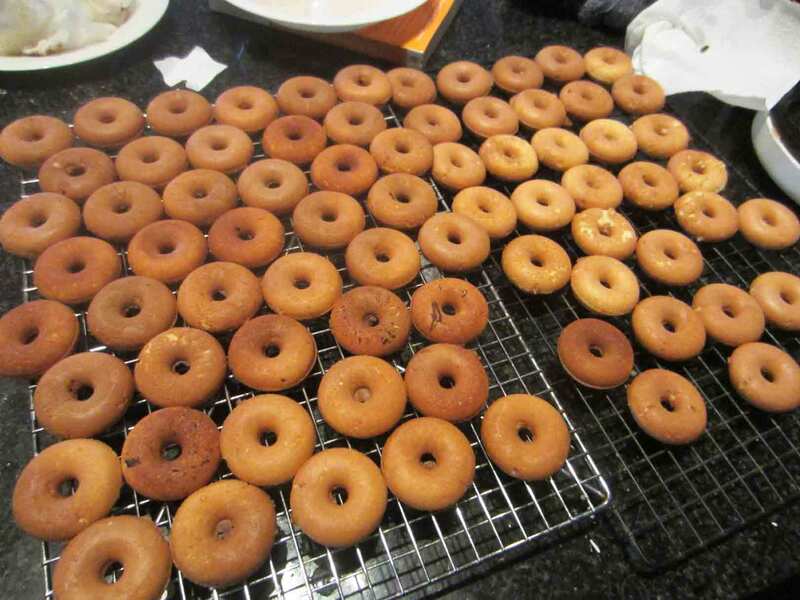 Anyway, so I mixed up the cake mix per the box directions, piped it into the heated donut maker, cooked for 3 minutes (2:30 if you want them extra-soft), and pretty soon I had a big batch (about 6 dozen) of tiny donuts. On to the decorating! I was definitely a fan of Laura Ingalls Wilder’s Little House series as a child. Wasn’t everyone? Okay, perhaps not, but I enjoyed the descriptions of the day-to-day life (however fictionalized), and one of the food descriptions that stayed with me was in the third book, On the Banks of Plum Creek, where Ma fries up a batch of “vanity cakes” for Laura’s birthday party. 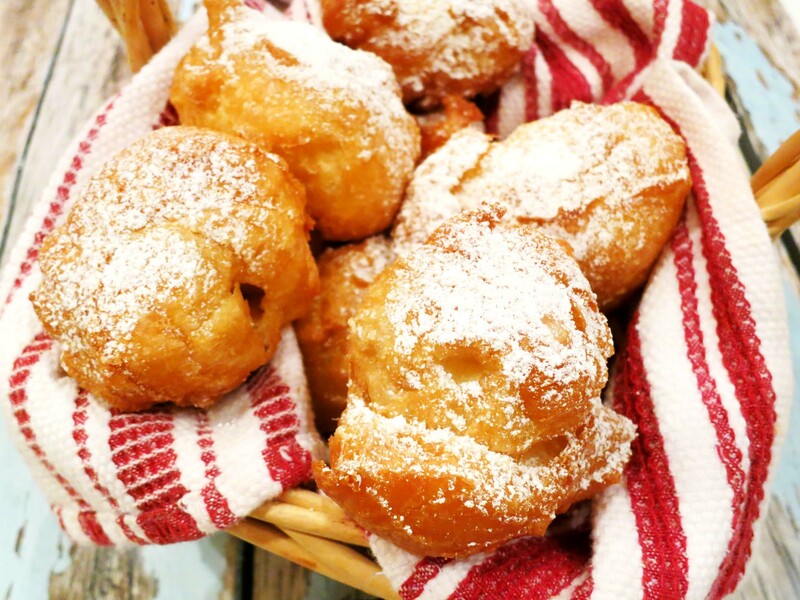 She made them with beaten eggs and white flour. She dropped them into a kettle of sizzling fat. Each one came up bobbing, and floated till it turned itself over, lifting up its honey-brown, puffy bottom. Then it swelled underneath till it was round, and Ma lifted it out with a fork. She put every one of those cakes in the cupboard. They were for the party. The cakes were not sweet, but they were rich and crisp, and hollow inside. Each one was like a great bubble. The crisp bits of it melted on the tongue. They ate and ate of those vanity cakes. They said they had never tasted anything so good, and they asked Ma what they were. As a kid I could picture these exactly– they’d be crispy and thin and about the size of a large plum, with a golden brown outside that shattered when bitten into, and maybe just a faint hint of chew on the inside. They sounded really delicious, and I wished I could try them. The Little House Cookbook apparently has a very basic recipe for these, but every single one of the online reviews for the recipe states that the cakes just don’t puff up that much– they’re dense and eggy, not crispy, and certainly not hollow inside. This didn’t sound right at all, so I had to think of some other way to achieve the effect. Then I thought of choux pastry.